Chief Executive Research produces actionable business intelligence for CEOs. 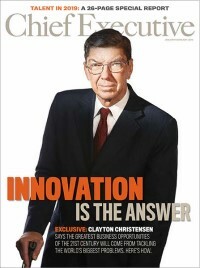 In addition to the proprietary research used for Chief Executive magazine editorial features, including the CEO Confidence Index, annual rankings of the Best & Worst States for Business and the 40 Best Companies for Leaders, we produce ready-made research (available for purchase below) and conduct custom research projects on behalf of our clients. Custom research – in the form of white papers, studies or supplements – may explore CEOs’ usage of specific technologies, business methods of other tools. We have also worked with partners on a range of custom events, from sovereign governments engaging CEOs to discuss business and/or investment opportunities abroad to educating CEOs about innovative solutions to their everyday challenges.